Svalbard, Norwegian Arctic Scooting around in the fog in our zodiacs we were slicing through very thin sea ice up in the arctic. 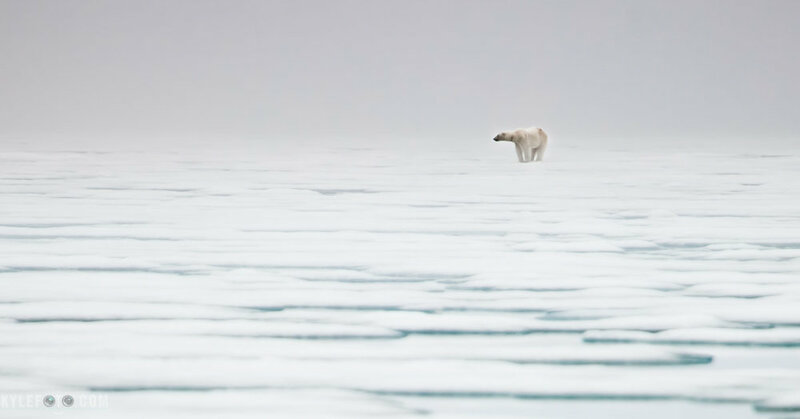 Always cognizant that a polar bear could be anywhere we were keeping a careful eye out. The best thing about travelling with other people is that what would be one pair of eyes is now 10 pairs scouring the misty veil that surrounds us. I was more concentrating on not hitting a large iceberg while driving the zodiac when someone exclaimed “I saw a blob move over there!” It took nearly a minute to fully locate this figure until it popped up from the surrounding white and stood out like an anvil on the horizon.